“Strikeforce: Houston” will be popping off tonight inside the Toyota Center in Texas. The first preliminary bout is scheduled to start at approximately 7PM ET/4PM PT. You can catch the entire main card on Showtime beginning at 10PM ET/PT. The event will feature two championship bouts. Ronaldo “Jacare” Souza will battle Tim Kennedy for the vacant middleweight crown, courtesy of Jake Shields’ expected exit. 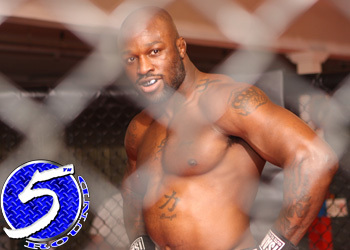 In addition, Muhammad “King Mo” Lawal makes his first Strikeforce light heavyweight title defense against Rafael “Feijao” Cavalcante in the featured attraction. King Mo is an NCAA Division II national wrestling champion who captured countless amateur titles before entering MMA. He was last seen showcasing his superior ground game against former champ Gegard Mousasi at “Strikeforce: Nashville” en route to snatching the 205-pound strap. We’ll be covering tonight’s show from beginning to end, so make sure to check back to 5thRound.com for our LIVE coverage.